(Seychelles News Agency) - Assumption island will officially become a clearance port for visiting vessels intending to cruise the outer islands of Seychelles after the Cabinet of Ministers endorsed the plan. For two years, a trial project was being carried out to see the feasibility of making Assumption a clearance port. The Cabinet voted to make the situation permanent last Wednesday. 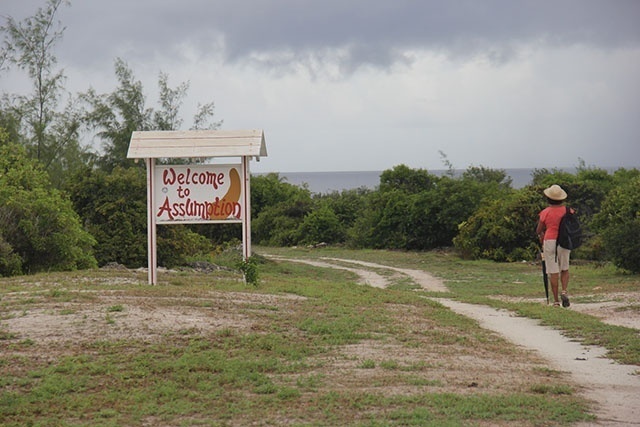 Assumption, which is situated some 1,140 southwest of the Seychelles’ main island of Mahe, is part of the Aldabra group and is managed by the Islands Development Company (IDC). “Officers from the Ministry of Health, the immigration's department, the National Biosecurity Agency, custom and police officers are flown to Assumption, where they board the vessel to carry out their respective clearance procedures,” said Joachim Valmont, the director general of the Seychelles Maritime Safety Administration (SMSA). No physical port was built to accommodate these activities. During clearance, officers check the reason why the vessel is in Seychelles’ waters and who and what is onboard. Valmont added that when boarding the vessels these officers are accompanied by at least two armed security guards, who later stay onboard the vessel while it cruises in the waters of Seychelles. At the time when piracy was at a peak in the Indian Ocean, it was agreed by The High-Level Committee in Piracy, that every vessel in the Exclusive Economic Zone (EEZ) of Seychelles should have armed security guards onboard. With the decline in piracy, the level has been reduced to at least two, regardless of the size of the vessel. The 115 islands of Seychelles in the western Indian Ocean have a total land area of 455 square kilometres spread over an Exclusive Economic Zone of 1.37 million square kilometres. The outer islands which consist of Aldabra group, Farquhar group, Alphonse group, the Southern Coral group and the Amirante Islands, are popular among tourist on island hopping. Officers going to Assumption are flown in on flights lasting between two and a half to three hours. During the debriefing of the Cabinet Meeting to the press on Thursday, the Deputy Cabinet Secretary for Institutional Affairs, Johny Bastienne, said that transportation cost for the officers is covered by the vessel needing clearance. “A cruise ship can be charged around $22,100 for the service,” said Bastienne. The Deputy Cabinet Secretary for Policy Affairs, Margaret Pillay, who was also present during the press debriefing, said that these vessels do not have to come to Port Victoria for clearance if they do not have any business in the port. “Before there was an agreement with Zanzibar, where these vessels were receiving clearance. This presented several security issues as clearance was being done outside of Seychelles and we did not know what was happening between Zanzibar and Seychelles,” said Pillay.